I have recently graduated from Leeds College of music after studying for three years under Sarah Markham. I began learning both instruments at an early age and gained passion and enthusiasm for both along the way. 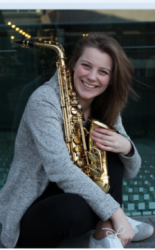 As a woodwind doubler, I have had a lot of experiences playing with different orchestras and ensembles including performances with Leeds College of Music's Wind Ensemble, and at the Symphony Hall with Sandwell's Youth Jazz Band. During my summer holidays away from university, I went into schools working with SIPS (Sandwell Peripatetic Music service). Under the guidance of Merle Calderbank, we put together several performances and concerts in primary schools (ages and 7-11). I have a friendly approach to music teaching that makes lessons fun and enjoyable. I think it's important to cater to each individual and their teaching types, so I aim to teach through a variety of methods and activities to ensure everyone can reach their full potential. Because everyone learns differently, I have no worries about whether you want to learn for fun or want to learn through grades and tests. AliceFrom Fagee (5/5): Alice is cool and she gets right stuck in to the lesson. Really enjoyed it and would highly reccomend her.